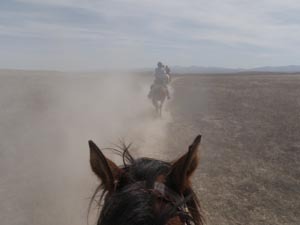 The trails were the same for the Owyhee Tough Sucker II... but we could have been riding in an entirely different desert. It's all about the weather. Storm clouds and rain during the Tough Sucker I painted the Owyhee desert different hues of gold and yellow, black, blue and purple; sun and heat during the Tough Sucker II made the desert bigger, dustier, and white hot. 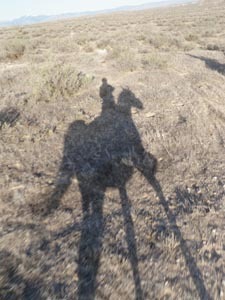 and long morning shadows over the dry Owyhee desert. 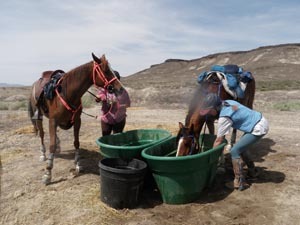 Horses didn't drink so much water at the Tough Sucker I, but most of the water tubs and sponge buckets were near empty on this hot ride, where one thermometer at Ridecamp showed 87° in the shade of a trailer. A decent breeze kept trail heat at a bearable level. 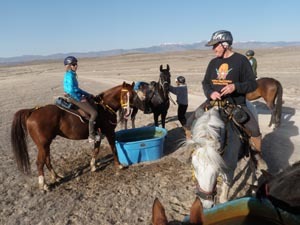 Hay stops, particularly at Hallelujah Junction were a treat and a rest stop on trail for the horses. Rhett and Steph, Jose and I posed at our favorite overlook of the Snake River. 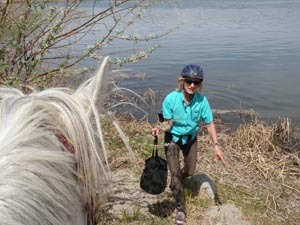 A breeze kept gnats at bay along the Snake River. Nance fetched water for all of us to pour on our hot horses. She tripped over that rock at her left foot, but John missed the shot! to another welcomed water stop. 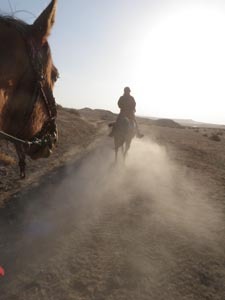 we followed the last of the dusty trail home, back to camp. 15 of 18 finished the 25 mile ride. Winner Flora Gertsch won Best Condition on Belesema Finalia. 2 Real Tough Suckers started and finished the 75-miler and tied for first; Karen Bumgarner and Z Summer Thunder won Best Condition. 20 of 23 finished the 50-mile ride. It's usually not a surprise when heavyweight rider Lee Pearce and 14-year-old Fire Mt Malabar win Best Condition, which they did again… but what was surprising is that it was Malabar's 30th Best Condition award. Could that be an AERC record? The pair won the National Best Condition award of 2011. 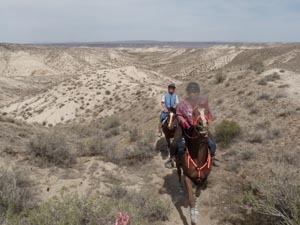 Malabar is a son of the redoubtable 7000+ mile, 1992 AERC Hall of Fame horse Sierra Fadwah +/, and knowing how tough Sierra Fadwah was, and how outstanding his get turned out to be, Malabar and Lee still have a lot of good miles of trails and Best Conditions ahead of them. 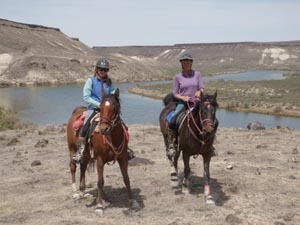 Owyhee Tough Sucker I: Riders on the Storm! 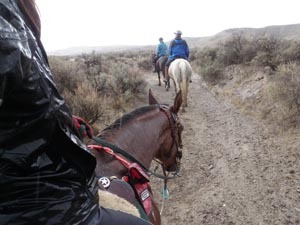 There's always something tough about the April Owyhee Tough Sucker rides, and it's usually the weather. And there are always tough suckers that come prepared for anything, usually the weather! The Owhyee Tough Sucker I didn't disappoint in the elements department nor in the rewards. 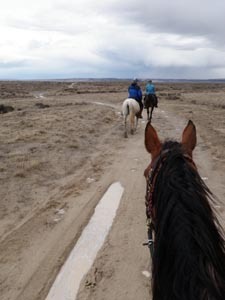 The 50% chance of rain and cool breeze didn't deter the riders, but it did keep the gnats away, which is always a bonus feature in the spring months. 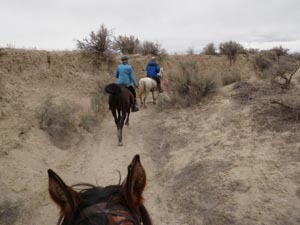 A heavy cloud cover kept the desert cool all day (convenient for those horses who hadn't shed all their winter coats yet) while steel blue storm clouds flitted to the east and west and overhead, scattering rain showers, painting the desert different moods, and testing the veracity of raincoats. 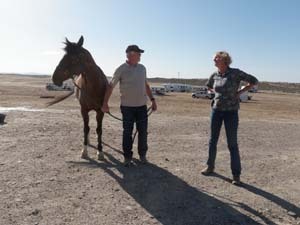 With John on the Dramatic Sunny, and Steph on the Amazing Flying Rhett (almost 22 years old, and 6000+ miles, and as Rhett as ever! ), I tagged along on Steph's wonderful Jose for the 50 mile ride. The trails were familiar, but they still always feel like you're still seeing them for the first time. 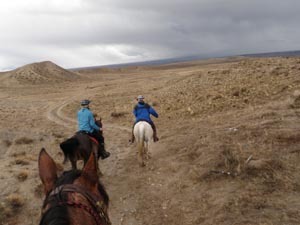 The Hallelujah Trail along one of the rims of the Badlands never gets old, offering a sweeping view from the Owyhee Mountains (under a wind-churned tablecloth of a snow cloud) to the black bluffs of Wild Horse Butte along the Snake River to the north, where we'd be riding on Loop 2. The striated yellow hills and lines of sediment still show where this land used to sit under water. Off the rim trail, the Hallelujah Wash (which you wouldn't want to be near in a flash flood!) led to Hallelujah Junction where you could imagine an old stage stop as the horses partook of water and hay. 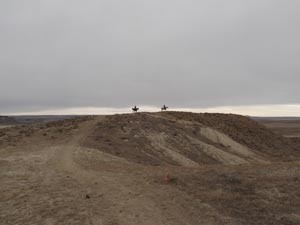 Climbing up the Hallelujah Badlands trail in a light rain shower, we emerged on the flats and into the breeze which dried us off by the time we reached camp for the vet check, where Robert the vet and volunteers were bundled up against the steady strong wind. 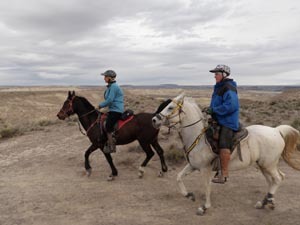 Loop 2 and the familiar jaunt around Wild Horse Butte still looked different under the blue gray clouds, the Snake River a silvery sliver beneath the imposing volcanic cliffs. Rounding the butte on the historic Oregon Trail, we followed an intriguing new cow trail back out through the maze of gullies and hills, just as one of those blue-black clouds found us and let loose with desert rain! The real desert rain where the dark clouds faded to a white haze of rain, real rain. 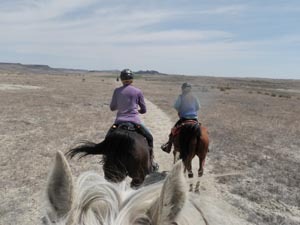 We hunched down in our raincoats as the tough horses bowed their heads and tried to throw their butts to the drops, while still keeping up the steady trotting, until the footing went south along with the trail. 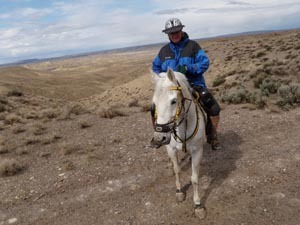 Emerging at Hallelujah Junction again for a water and hay break, the desert rain continued, puddles started collecting and the trails became little streams that turned the footing to Owyhee Gumbo. Just a little rain damps down the dust; just a little more and the ashy sand turns to clay that sticks like glue to feet. By the time the footing got better (harder two-track roads), the sun had come out and with it the stunning beauty of the desert: the Hallelujah Badlands to the west were spotlit in gold, the Snake River cliffs to the north were splashed in purple and black beneath yet another fierce dark blue storm cloud. Just a little bit of renegade lightning and thunder to the south kept things… interesting… but not scary. Horses and humans dried off again, then the clouds came again and we arrived back at camp at the finish at the start of another lovely rain shower. It just doesn't get old - the wonderful horses, the awesome trails, this sport of endurance and the Tough Suckers who do it. 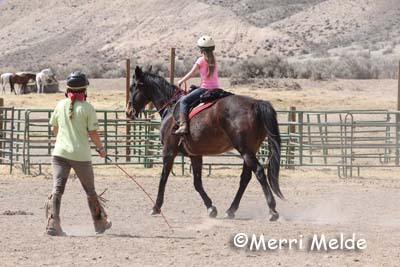 There were 4 new riders, two juniors, and a few horses who successfully completed their first rides. Ride manager Regina's waiting hot dinner and the ridiculously tasty desserts (one by Carrie) during the awards were additional rewards for the Tough Suckers who braved the Owyhee Storms. Tough Sucker II is April 27: bring it on! We're doing our part, here in a little corner of Owyhee County in Idaho, to increase AERC membership. 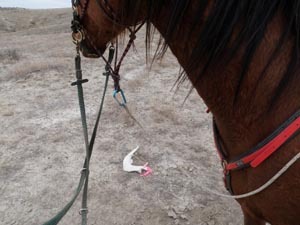 Nab a horse-crazy little kid, hold her hostage with a bunch of endurance riding nuts, house her with an endurance-riding aunt, lecture her only in the endurance tongue, overwhelm her every night with valiant tales of endurance riding adventures, stick her in the saddles of many endurance (and 1 non-endurance) horses, and point the way down the training trails. 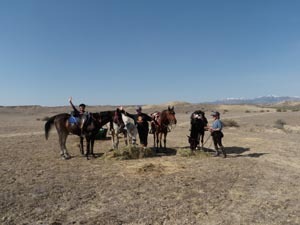 Sarah's back at the Owyhee Spa this week, climbing aboard everything with 4 legs (except the dogs) - from her pal and mentor, trusty old Orlov Trotter Krusty, to the opinionated part-Arabian part-Ego Finneas, to the retired Thoroughbred ex-racehorse Stormy. 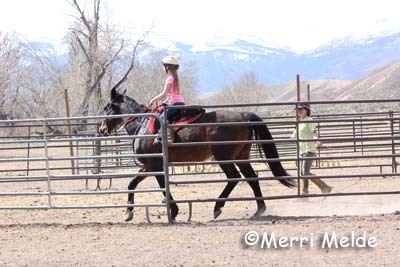 In her riding lessons with Connie, not all horses are the same, Sarah is learning - some you have to take more charge of than others; some you have to request rather than demand things of; some you have to direct more than command. 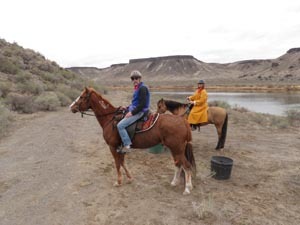 She's learning to be a Horseman, something that will be valuable on the endurance trails. 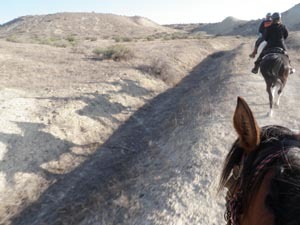 Sarah already knows all the local endurance riders, and keeps tabs on them by checking the Ride Results in the monthly Endurance News magazine. She's already picked out all the rides she'd like to attend this year. 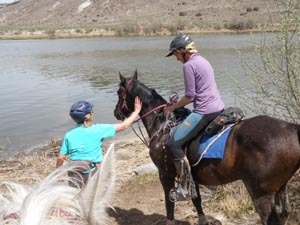 When she gets her own endurance horse and her driver's license, she'll not only be logging the miles, but she'll help recruit you too, so watch out!